The 7-inch tablet market is about to see a new member jump into the fray. The Verge reports that Microsoft is working on a 7-inch gaming tablet called Xbox Surface that will include a custom ARM processor and high-bandwidth RAM designed specifically for gaming tasks. Hardware specifications are not currently set in stone and could change to accommodate an Intel SoC, but work the Xbox Surface is supposedly moving ahead independent of a specific hardware architecture. The forthcoming tablet won’t run a full version of Windows or even Windows RT. Instead, it will run a custom Windows kernel with support for messaging and other tablet functions, but with a focus on gaming. Further details remain scarce at the moment as Microsoft is being particularly secretive about the project. The report notes that the company recently locked down several Xbox-related buildings, limiting access to employees from the Interactive Entertainment Business division only, and speculates the lock down could be related to Microsoft testing the tablet and working on games and software for the device. 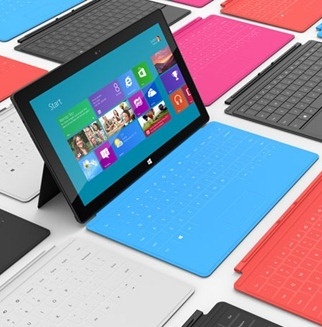 Microsoft’s 10-inch Surface RT tablet went on sale less than a couple of weeks ago on October 26. Initial reactions from reviewers and consumer have been a mixed bag, with some praising its solidly engineered form factor, while most complained about the lack of quality apps on the Windows Store.